Been thinking about what I'm going to use for camera support for the BMCC. Thinking I want to rig with an Arri style dove plate so that transitioning between sticks and shoulder is really fast. But that does not take into account just leaving the camera set up as simply as possible, another consideration. With all that in mid I'll likely end up fully rigged a great deal of the time. That means follow focus, monitor or evf or both, batteries on some sort of distribution plate, some type of sound device like a juicedlink, a reference mic, a mattebox when it's necessary, etc. It adds up. For my DSLR setup I currently have a variety of Manfrotto's and they are sticky. You get what you pay for so I'm planning to replace to replace these. Been looking at used Sachtlers, possibly Cartoni's, and Miller's. I love the Oconnor 1030 but it's more than I can afford. What are you using or planning on using? Did you buy new or used? Last edited by Marshall Harrington on Sun Feb 03, 2013 5:33 pm, edited 1 time in total. Thanks Peter, saw that. This question is specific to tripods and heads, not rigs. I want to hear what people are using or planing to use so I can benefit from their experience. If you can edit the topic title to "sticks" or "tripods", it might help distinguish this thread from the rigs etc. I'm hoping my Manfotto 701HDV head will suffice if I keep my weight down but I fear I may have buyers remorse for not getting a heavier head when I bought the 701 (head only rated for 4kg which was fine for my camcorder; tripod rated for 15kg). Edit: corrected the head I have which likely won't be good enough after all. Last edited by rick.lang on Tue Feb 05, 2013 5:18 am, edited 1 time in total. OK guys made the change in the title as suggested. What tripods are you using or planning to use and why. How much did they cost or what do you expect to pay for them. I've been using a 504 head with the 546B sticks. Leaves a lot to be desired. The head is sticky on any long lens pans and the tripod locks are constantly a problem so the legs slip from time to time. Don't get me wrong, that they are a great deal but when you don't get the shot the low price is a mute point. I usually begin my shot set up on a tripod fully rigged. That means rig, follow-focus, monitor, evf, or both, battery, sound device like a juiced link, mic, matte-box when needed. My plan is to have this arrangement set on on a dove plate to quickly transition to a shoulder rig. My point in mentioning this rig information is as reference to the weight. Likely around 20+ pounds often. Don't get me wrong. I understand being as stripped down as possible is great it's just in a the situations I often find myself once the scene is happening I need to be quick to transition between types of shots, and stripped down does not give me enough flexibility. So what are your thoughts on the tripods and heads? I have the universal cage from Bebop. Comes with a dovetail plate and it became my standard workhorse setup for the BMC. The only tripods I have used - but this is probably also due to the fact that i am in germany - are sachtler and manfrotto. They both do what the price difference suggests: sachtler is great and super expensive, manfrotto is by a thin line above the rest of the cheap tripods you may find. If you want to do a super smooth slow pan with a heavy camera... Forget the manfrotto. Rather rent a sachtler for the day... Btw I am talking about heads here. For the legs: don't care, the real difference is about how smooth you can move the camera. Frank Glencairn wrote: I have the universal cage from Bebop. Comes with a dovetail plate and it became my standard workhorse setup for the BMC. Frank, I've seen your rig when you posted previously. It looks really good and is one of the possibilities that I'll choose from. I'm going to wait until I've got my camera. But what head are you putting the rig on and what sticks? tilllt wrote: The only tripods I have used - but this is probably also due to the fact that i am in germany - are sachtler and manfrotto. They both do what the price difference suggests: sachtler is great and super expensive, manfrotto is by a thin line above the rest of the cheap tripods you may find. If you want to do a super smooth slow pan with a heavy camera... Forget the manfrotto. Rather rent a sachtler for the day... Btw I am talking about heads here. For the legs: don't care, the real difference is about how smooth you can move the camera. You round it up pretty well on the Manfrotto. Which Sachtlers should I be looking at. I figure about 20-25 lbs fully rigged not including any large lenses. My favorite setup is heavy duty 150mm bowl Vinten sticks and head (I'm a die hard Vinten fan boy), but the head alone weights 16 lbs, so I only use that in controlled environments (narrative set, commercials), where I can go with my truck and have some helping hands around. They can carry up to 14 lbs and are surprisingly good for the money. I dumped the head and swapped it out for a Manfrotto 504HD, that I had laying around. I hate that head, but it's halfway decent for this kind of "on and off the road" work. I tried the Miller DS-10 this week after reading great reviews. It was very smooth with my FS700, but I didn't like the drag adjustment range. Even at minimum, there is quite a bit of drag. With a lightweight BMCC, I think it would be more of a problem. What makes you think the BMC is lightwight? It's about the same as a FS100 with a big battery. Oops, my mistake. I've never actually held one, I just assumed the BMCC would be tiny. I guess they're both around 3.3 pounds. Elliott Balsley wrote: Oops, my mistake. I've never actually held one, I just assumed the BMCC would be tiny. I guess they're both around 3.3 pounds. My favorite still the 1030! I tested a few tripods since October. The Manfrotto 509HD is not bad but found a few problems with the test ones. We have a Sachtler V15SB and S20 at work, major drool factor there but the cost way up there. I tested these Sacthler knock-offs from SECCED. They were not too bad and has some back story that the tech is from older Sachtler. A decent one that holds 27lbs was 2300 USD last time I checked. Currently using a really old Miller 25 with al-sticks. When I had the BMCC in my scopes, I was going to get the Sachtler FSB8T but that only holds 20lbs. Now Im hearing you need more than that if your are a serious Cinema user. I got to use an Oconnor 1030HD with the 25L sticks for a three week project. Spoiled me. Especially after the 504/546B package. Looking at the Vintens after the suggestions pointing that way. They look really nice but like the Oconnor very expensive. Wondering which model of both Vintens and Sachtlers compare to the 1030/25L combo? Can anyone please share his opinion on that combo for a rigged BMC: : Vinten Vision 5 LF head on a Vinten ProTouch PT350 (350V IA29) tripod. I could get it used for 385,- EUR but can't find any info as it seems to be some older models. Should be capable of holding 10kg. 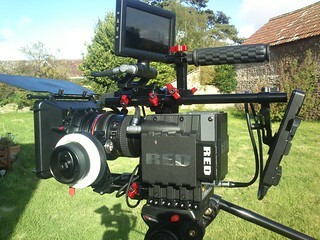 I've used the BMCC plus a modest rig (follow focus only really) on a Manfrotto 504HD with more than acceptable results. It's not a DSLR, but I certainly wouldn't consider it heavy. I concur with the above poster. I run the Scarlet at about 18lbs fully rigged and this doesn't trouble my Manfrotto 501HDV head. And like someone else said, its sat on "cheapy" legs. They came with a useless "fluid" head. But they were ultra sturdy legs with a spreader and had a 65mm bowl attachment. Bought a 75mm Manfrotto bowl/flat-top adaptor and alls well that ends well. Recently I found an old o'Connor Model 50, it is a head from the 70s, looks a bit oldfashioned but works smooth even with heavier cameras up to 25kg. Since it was so cheap I just wanted to give it a try. It just convinced me. I'm used to Vinten and Sachtler, but have used the big O'Connor and Ronford rigs. I really like Ronford legs, they are built like tanks, but tend to come as Mitchell and would be overkill for most rigs these days. My go to tends to be Sachtler video 18 with (battered) Alu sticks. Sachtler has a few very nice sub $2000 head/stick kits at B&H and elsewhere. For what it is worth, the folks at Really Right Stuff showed a new leg set and new head system at NAB and according to their executive, they should be shipping in August 2013. I saw both kits in April in Orlando and was very impressed with the quality and smoothness of the head. RRS Carbon Fibre leg sets are superb with excellent capacity and proven vibration dampening. There's a bit of info so far on their site in case anyone is interested. When I wrote this original post I was having problems with my Manfrotto 504. I couldn't pan and it was driving me crazy. As with many other items on this blog, I've asked a lot of questions. Frank, Peter, the folks at Blackmagic (when you ask them directly), and many others have unselfishly provided a wealth of knowledge which I appreciate immensely. In the case of my question about tripods Frank mentioned Vinten. I was really stuck on Oconnor or Sachtler but Frank and Peter's information about equipment in other posts was so spot on that I started looking at Vinten. I knew that I did not want a 150mm bowl for my personal kit. To big and heavy. My BMCC when currently rigged weighs in at 26.5 lbs. I wanted a tripod/head whose sweet spot was centered on that number. Sachtler, Oconnor, Cartoni, Miller. . . they all make great gear. But I wasn't familiar with Vinten . Boy was I in for an education. I started looking at Vinten 11's, finally finding a used Vision 100 on carbon Pozi-Loc sticks with mid level spreaders. I've got to tell you what a relief it is to finally be able to pan. So simple but essential. I'm now looking for something small and super-light for a stripped down version of the BMCC that will also work with the Pocket. 75mm bowl for sure. Likely a small Sachtler, maybe a Vinten. I really like the Miller carbon Solo sticks but am open minded there. Just the camera, lens, maybe an EVF. A setup so easy and light that it's easy to have it with you and set it up or carry it around. Coming from photography we had 8X10's and lots of 4X5's but also had Leica's at the ready for when something was coming down fast and you just need to reach for it. So the point of my post is thanks for all the help. Especially Frank, Peter, and John B. My work is better for hanging around here and asking questions. I've got a long way to go so I hope you'll continue to be patient with my questions. Here's my setup now. I've re-purposed most of the gear from my DSLR and there are much better products out there now. Still need a more substantial power system that will handle long days, I've a Zacuto EVF and would like an Alphatron, and the monitor is the original Marshall which is somewhat out of date compared to the current crop. But it all works for now. My shooting's improving. I'm using a Manfrotto EDIT: 502 on Vanguard legs. It works well for me, but I don't have much except the camera mounted on it. Nice smooth motion at a variety of drag friction settings. Maybe worth stripping it back and seeing if your luck improves? The only time I have issues with it, incidentally, is when it's not tightened sufficiently to the base. Lock it down and it's good. EDITED: Previously said 504 instead of 502. Sorry! Last edited by Iain Anderson on Mon Jun 17, 2013 12:23 am, edited 1 time in total. When shooting with the 504 also using just the body and a lens I could not achieve glass smooth pans no matter what settings were attempted. I tried repeatedly with the same result. Tilts were better. Free movement was predictably jerky. Never thought the base or the tripod was contributing as it's always tight. Right away with the Vinten, pans are smooth. Oddly to me (it should come as no surprise as that is what it's design for) it prefers the heavier weight. I am trying to decide between the Manfrotto 502 and the new 500 head. Has anyone tried both of them and could comment on smoothness? So you guys think Manfrotto 504HD Pro head + Manfrotto 545B Pro legs would not work smoothly in combination ? Good choice on the Vinten. I've got a Vision Blue head and legs that travels with me and its great. My only wish with hindsight is that I got something carbon, its very heavy dragging around airports with a Pelican case and suitcase. Maybe you could look into Miller DS5/DS10 for your portable setup, maybe with carbon legs? I have to say that I am using the Manfrotto 509HD and this is the first Manfrotto Head I am really happy with. It works beautifully with my fully rigged BMCC, panning is very nice. As for the tripod - someone here complained about the 564B that it is not holding the weight. You can adjust the screws of the legs so they hold tighter. The 546B is ok for it's price, but I don't really like it, the locking mechanism is clumsy and its not easy to change the heights. Margus - Don't get me wrong, I'm not trying to say anything bad about Manfrotto. I own a ton of Manfrotto gear. Light stands, grip dear, tripods, on and on.... Great gear for the money. Just to be clear I have the 504 head that sits on the 546B sticks. The head is definitely sticky when panning regardless of weight. It gets worse with more weight. The sticks work fine, although you get what you pay for. The locks are nylon or some sort of flexible plastic. When you lock them they some times are not properly seated therefore have a tendency to slip. After that happening a few times during a shot I learned to double and triple check each lock with each setup. Honestly I'm used to better gear but again you get what you pay for. Robert - I had heard good things about the 509 and was looking at that as well before I got the Vinten. I looked at Sachtler, Oconnor, as well. I made lots of call and got a bunch of great advice from all the company reps. The piece of advice that stuck was to weight my setup fully rigged and target that number as the center of the suggested payload range of my intended head and go from there. That allowed me to narrow down my choices a great deal. So now I'm starting to look for a tiny ultralight head with ultralight sticks in anticipation of the Pocket Camera as well as the BMCC stripped down to a body with a lens. Been checking out the Vinten 3 and the small Sachtlers. Any suggestions would be appreciated. So the Vision blue5 should be reasonable for regular BMC setup? Margus Voll wrote: So the Vision blue5 should be reasonable for regular BMC setup? First, what is the weight of a regular BMC setup. 12-26 pounds is what they say that head is rated for. The center of that is 19 pounds. Weigh your rig or your intended rig. Is it at the center of the target rating? Second, the size of the bowl matters. I'm still listening to Franks advice on the 150mm bowl. Can't remember exactly which head he was speaking of but my experience with larger gear is its much, much smoother. That being said I decided for my personal kit, when I'm not renting, that I'd need 100mm. Small enough to carry without a large team, but big enough to handle the center of my rig which is currently 26.5 lbs. Note: I do not use my camera rigged up all the time. Far from it. Stripped down has it's place. Moving quick means either being light or having a bigger team. In my case I often work alone or with one assistant. Also like to travel and shoot. That's just a different need and will mean a second head and sticks. 75mm bowl and carbon sticks for sure. Probably looking at payload of 7-8 lbs max, mostly lighter. To give people an idea of the weight of their camera and accessories...here's the breakdown I've come up with after some research. Weights are rounded slightly. So 3.8 lbs would be 4 lbs. 3.3lbs would be 3lbs. You can easily get your rig up to 26lbs...short of running the camera with just a small lens and tripod mount, It would be hard to keep your load under 8lbs. I would suggest "budgeting" for roughly 15 lbs if you plan to use a matte box and some sort of rail mount and/or battery. sean mclennan wrote: ...You can easily get your rig up to 26lbs...short of running the camera with just a small lens and tripod mount, It would be hard to keep your load under 8lbs. I would suggest "budgeting" for roughly 15 lbs if you plan to use a matte box and some sort of rail mount and/or battery. That is very useful. Combined with the advice to select a tripod/ head where that weight ideally is the mid-point of the recommended weight range means a head that can carry at least 35 pounds, maybe a head rated for 12 to 38 pounds. Definitely larger than I had anticipated. I was thinking Sachtler FS8 but back to the drawing board! Yeah, I'm sure you could get away with slightly less, but I'm sure it's more than many people thought. Also remember some heads have a minimum rating as well. So 8-26lbs...middle ground would be 21, not 13. I've seen several people who just "half" the max rating. Doesn't work that way! sean mclennan wrote: ... Also remember some heads have a minimum rating as well. So 8-26lbs...middle ground would be 21, not 13. I've seen several people who just "half" the max rating. Doesn't work that way! Maybe a typo there. I think you meant to say if the rated range of the head was, for example, 16-26 lbs, the middle ground would be 21 lbs. I use a Giottos 6 layer carbon fiber tripod MT8360 with one of their fluid heads and then for travel I have one of there really small carbon fiber tripods that I can put that fluid head on...Looks weird on the really small one but it works and is so small and light. For third point of contact I use the small pocket rig from Edelkrone. The MT8360 is light for its size as well and pretty sturdy. I like the twist locking legs and how low to the ground this tripod can go. I actually bought it specifically for some really low macro work but anyways. I use this tripod with my D800 setup and I used it with the BMCC with large lenses. Its not a super cheap setup but it's not crazy expensive and my kit is very light which is most important when Im trying to go places no one else would. Also I always try to think if I wont take it with me because its bulky, heavy or whatever then I'll never use it. Oh and Ive heard at least here in canada that Giottos have had some issues with having local suppliers so I was able to buy my tripods in the stores but the fluid head I had to get off a store on ebay. I've been thinking about just going with the Kessler tripod and Hercules head, especially since I use a slider a lot, but it most certainly is not travel friendly. Does anyone have hands-on experience with the Sachtler ACE Series? What can anyone say about Libec's RS-450? My full setup is around 23lbs (11kg) and I like that the head has continuous counterbalance, that is great depending on reviews. Although I hate that it is only 75mm. I have a chance to buy SACHTLER ENG2D legs and add Libec RHP75 head later which is 100mm bowl. Is those Libec heads really good as told they are? Yeah, that's true. I personally own manfrotto stuff since im poor but ive used sachtler head/sticks for years and years at the tv stations ive worked and i always tend to rent the sachtler fluid heads over o'conner ones. I just really like the layout and control. Very useful thread! Could someone recommend a head for more based setup? As I do mostly doc field work in small communities, I need to keep my setup at minimum in terms of size and weight. I have the BMCC in wooden camera cage, a battery and a small monitor (still considering), which is within the 4-5 kg range (9-11lb). The thing is I really like the flat base heads on photo sticks, as I need to be portable and rarely shoot at more than a meter from the ground. I was looking for a manfrotto 502AH head, but your feedback here make me reconsider as I want smooth pans, which my current 500AH struggles to do... Any recommendations are welcome! Nikolay Smirnov wrote: What can anyone say about Libec's RS-450? I just bought Libec RS-450RM... my rig tops at around 12kg and the tripod/head handle it without any problem, staying smooth and sturdy. I only tested it in the house, though. Absolutely don't mind some "battle scars" on the equipment as long as it works.